Lynn K. Nyhart. Biology Takes Form: Animal Morphology and the German Universities, 1800-1900. University of Chicago Press, 1995. Morphology—the study of form—is often regarded as a failed science that made only limited contributions to our understanding of the living world. Challenging this view, Lynn Nyhart argues that morphology was integral to the life sciences of the nineteenth century. Biology Takes Form traces the development of morphological research in German universities and illuminates significant institutional and intellectual changes in nineteenth-century German biology. Although there were neither professors of morphology nor a morphologists’ society, morphologists achieved influence by “colonizing” niches in a variety of disciplines. Scientists in anatomy, zoology, natural history, and physiology considered their work morphological, and the term encompassed research that today might be classified as embryology, systematics, functional morphology, comparative physiology, ecology, behavior, evolutionary theory, or histology. Nyhart draws on research notes, correspondence, and other archival material to examine how these scientists responded to new ideas and to the work of colleagues. 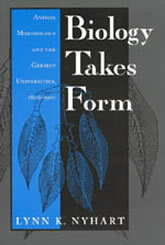 She examines the intertwined histories of morphology and the broader biological enterprise, demonstrating that the study of form was central to investigations of such issues as the relationships between an animal’s structure and function, between an organism and its environment, and between living species and their ancestors.